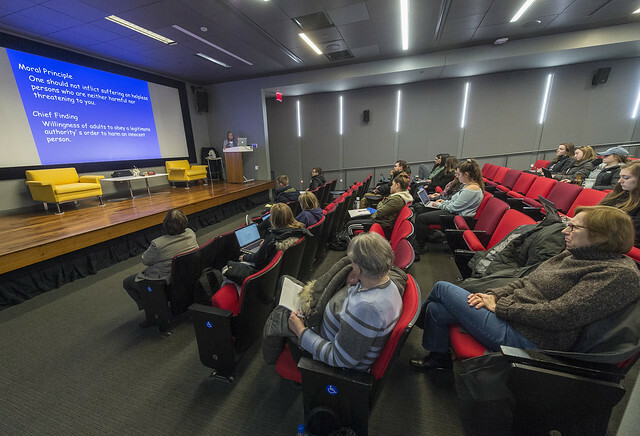 Sacred Heart University began its new “Heart Challenges Hate” series with a discussion on the psychology of hate with Michelle Loris, chair of Catholic studies, and Christina Taylor, psychology professor, in the Frank and Marisa Martire Business & Communications Center theater in late January. This was the first of a four-part lecture series planned in response to the troubling prevalence of violence in the United States and the world. All four discussions will explore hate's roots and resolutions. At the first event, Loris told the audience she hopes the lectures enable an open discourse of ideas. She said the best way for a university to challenge bigotry and hate is through education and reasoned, informed discussions. Loris added that starting the series on the psychology of hate made sense, so audience members would learn where hateful actions come from and how to stop prejudices. The lecture opened with a five-minute clip of esteemed psychologist Philip Zimbardo speaking about his book, The Lucifer Effect: Understanding How Good People Turn Evil. After the clip, Taylor presented the many explanations and studies of factors that bring about hateful behaviors. There are conditions that breed hatred, Taylor said, and when groups form, hateful tendencies can develop. “We look at the group we associate with as the superior group,” she said. “Biases form and lead to group favoritism.” This can lead to one group acting badly toward another, she said. Groups also have the power of doing good. “We see extraordinary good acts done by groups…But groups can also increase aggression. They see themselves as less accountable and lose sense of individuality,” Taylor said. Taylor cited Zimbardo’s Stanford prison experiment, a 1971 study that enlisted college students to take on the roles of prison guards and inmates. The students playing the guards let the power overtake them. “The guards behaved brutally,” she said. “They unleashed aggressive behavior.” She explained those students weren’t bad people, but when they were put into the situation they became aggressive. The study was supposed to last three weeks, but Zimbardo had to end if after six days. “When we talk about evil, we all have the potential to behave in those demonic ways, but we can also be heroes,” Taylor said. Discussing ways people can combat hate, she cited psychologist Gordon Allport, who believed simple contact with someone who is different can change someone’s bias. Loris encouraged audience members to recognize their biases and to do what Allport suggested: talk to someone who is unlike them and get to know that person. Changing perspective is another way to combat hate, Loris said. Thinking what life is like for another person will allow empathy. “Think about things from their point of view. Get a different perspective. Try to feel and have a connection. We can’t make someone who is different the ‘other,’” Loris said. She also suggested the audience read the news to learn more about people and their struggles. The lecture ended with both professors reminding the audience to be opened-minded. Professor Bill Yousman will address the rhetoric of hate in the media at the next “Heart Challenges Hate” lecture Feb. 27 at 7 p.m. in the Martire theater. If you are unable to view the photos above, visit the Psychology of Hate Flickr gallery.